For decades, authors have been drawing parallels between the rise of digital technology and the invention of the printing press. It’s a worthwhile comparison: both have changed the way people transmit, produce, and ingest information. Notions of power and access are central to these comparisons. Scholars argue that the printing press, much like the World Wide Web and other digital innovations, leveled the playing field and provided more access to information. Gutenberg’s invention allowed new knowledge to circulate, laying the groundwork for the kinds of discoveries that would define the Renaissance and the Scientific Revolution. It helped produce the type of literary, philosophical, and scientific texts that would forever influence how people discussed and perceived the world. The problem is that print was not just used to spread intellectual freedom and new information. It was also complicit in acts of repression. 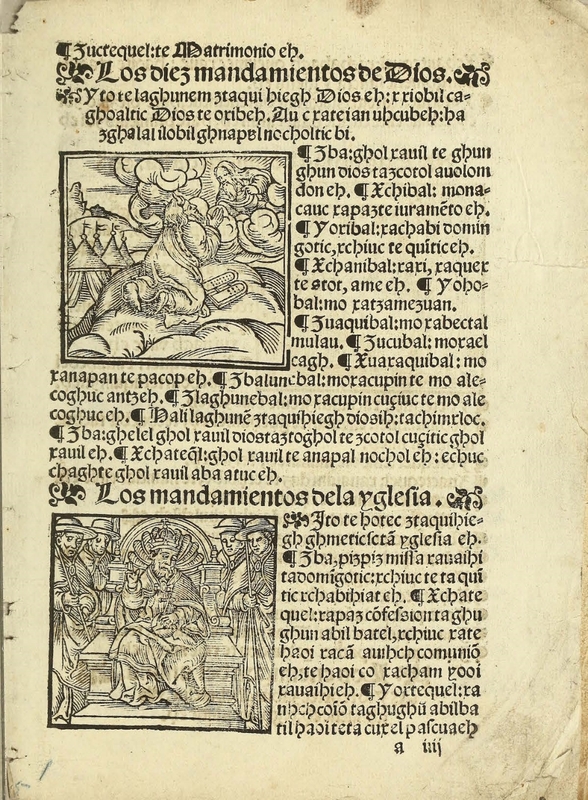 As a prime example, Gutenberg’s press, while opening space for new religious ideas through the reformation, also helped launch the violence and censorship of the counter-reformation. The cultural values behind a given medium affect the information it produces just as much as its technological components. At the end of the day, the cultural values behind, and political uses of, a given medium affect the information it produces just as much as the physical technology that constitutes it. If we truly want to understand the transition we’re living now, the one that is taking us from books to digital platforms and from pages to screens, we must understand the cultural values behind these media formats. The comparison between digital technologies and the rise of the printing press is incredibly useful. However, in order to understand the degrees of freedom and openness associated with the printed book, we should focus not on the physical technology of the printing press but rather on the cultural values behind the book, and particularly the perceived superiority of western alphabetic language. The rise of the printing press in a colonial context demonstrates how this perception operated. Situating the printed book in colonial Mexico (home to the first printing press in the Americas) allows us to grapple with what Walter Mignolo calls “the darker side of the renaissance” (Mignolo, The Darker Side) Indeed, the story of the colonial Mexican book also provides a starting point to think about some of the darker sides, as well as the possibilities, of digital technologies. Books, and particularly dictionaries, became instruments for expanding the Spanish empire. The dictionary, then, was recognized as a tool of empire. It would help spread an imperial language and culture. The first books that Europeans published in Mexico, with the help of indigenous scribes, translators, and printers, reflected this emphasis on the civilizing force of the dictionary. These texts are largely religious and linguistic ones. They are grammars, prayer books, and dictionaries, created in order to aid friars in the evangelization of the native population. 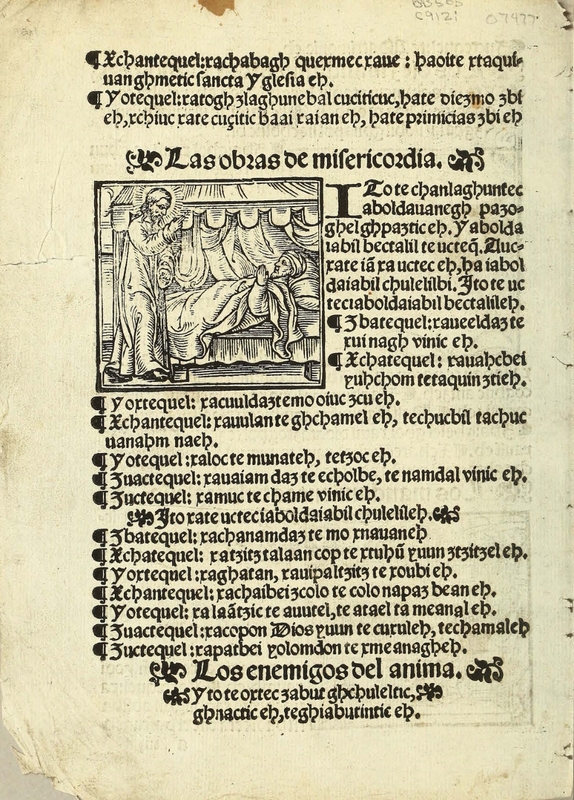 Nebrija’s dictionary, and the cultural values behind it, informed the first years of print in Mexico and helped catalyze the colonization of Mesoamerican territory.The grammar became, as Mignolo writes, “a cornerstone for the for the politics of language, implemented by the Crown for the purpose of expanding the Castilian empire” (“Writing and Recorded Knowledge” 294). When the printing press was installed in the Americas for the first time, certain cultural hierarchies were installed along with it – namely, the perceived superiority of alphabetic Western languages and Christianity over indigenous cultures and forms of expression. When the Spanish arrived in present-day Mexico City, the Nahua indigenous population (the cultural group that founded the Aztec empire) employed a pictographic painting and writing tradition. In fact, in Nahuatl, the principle language of the Aztecs, the same word (tlacuilolizti) means both ‘to paint’ and ‘to write’ (Boone, "Writing and Recording Knowledge" 3). Pictographic methods were used for everything from record-keeping to songwriting to the documenting of religious ideas. The ‘paintings’ that expressed poetic or religious knowledge were often accompanied by oral interpretation, articulated by members of the political and cultural elite according to traditions that had been passed down through the generations. When the Spanish arrived to Mesoamerica, they came from a Western culture in which alphabetic text was used to record facts and deliver linear narratives. European text, assembled in manuscripts and later in print, was often accompanied by illustrative mimetic images – images that sought to illustrate the world as the human eye saw it. Mexican pictographic documents were dramatically different. Pre-Hispanic codices (of which only 15 have survived due to destruction during the colonial period) were prepared on long strips of bark paper or hide and conveyed information through sets of image-based symbols (Gimmel 178). These glyphs signified objects, ideas, and names – sometimes by indicating a phonetic sound in that word and sometimes through metaphorical representations. Pictography generated knowledge through the diagrammatic and relational structures of sets of glyphs, as well as through the oral interpretations that specialists performed when reading these documents. European alphabetic writing, on the other hand, was designed as a linear sequence of symbols that is especially suitable for linear narrative structures. The alphabet is a glottographic system that represents, in the first instance, phonetic sounds that are then used to construct ideas. Pictographs, on the other hand, are primarily semasiographic, signifying directly through icons and signals without passing first through each phonetic sound of a word (Boone, "Discourse and Authority" 228). Colonial books like these demonstrate the traditional European use of alphabetic text accompanied by illusionistic images. This represents a profoundly different expressive form than the pictographic one used by indigenous groups in Mexico at the time. Friars and conquistadores dismissed indigenous writing systems as simple drawings with idolatrous content. Despite the intricacy of pictography and its ability to express complex concepts, the majority of friars and conquistadores, upon viewing indigenous documents and symbols, saw only simple drawings. For them, glyphs, paintings, and symbols couldn’t possibly be equated with ‘real’ language. Language was built from letters that corresponded to phonetic sounds and grammatical rules. It was comprised of the structures that Nebrija had analyzed and disseminated in his grammar of the Spanish language. Indeed, sixteenth-century humanists believed (as many writing specialists and historians do today) that textual methods express truth and reality more accurately than pictographic or oral ones and that the alphabet symbolizes a more advanced and civilized form of expression. However, text is not simply an improved way to communicate the same ideas more efficiently than using oral or pictographic methods. Mesoamericanists have demonstrated that these very different modes fulfill similar cultural, communicational, and aesthetic needs. Elizabeth Hill Boone writes that "like alphabetic writing, [pictography's] effectiveness was measured according to its accuracy in recording concepts and facts, and like mimetic painting, its perfection was judged in terms of its poetics, balance, and graphic execution" ("Ruptures and Unions" 197). We can also look to our contemporary society to see the ability of image-based expression to convey complex and useful information. If pictographs represent a semasiographic (rather than phonetic or glottographic) system of symbols, so too do modern methods for representing music, choreography, mathematical equations, and data (Boone, Stories in Red and Black 30 – 33) The many signs that orient us in every-day situations, from emoticons and memes to traffic signs and the icons used in instructions are also pictographic in this sense – taking us directly to a concept without passing through phonetics. Section of the Codex Colombino, a pre-hispanic Mixtec Codex painted on skin that uses images to tell the story of a Mixtec ruler from the 11th century. From the Codex Boturini, a pictographic history of the founding of the Aztec capital Tenochtitlan. The Siguenza Map, shown above, functions as both map and history and contains glyphic representations of geographic landmarks, dates, and cities. It, like the Codex Boturini, narrates the foundational story of the Aztec empire, characterized by a pilgrimage of the Mexica peoples to Tenochtitlan. Semioticians remind us that image-based and alphabetic symbols must both be considered communicative codes. Whereas linguists traditionally placed images outside of language (as an intermediary point between the textual ‘signifier’ and the conceptual ‘signified’) semioticians like Umberto Eco argue that the ‘iconic’ or image-based sign does represent its own structure of communicating if and only if the cultural referents of these images are understood (Yuste 200 - 201). In La Estructura Ausente, Eco writes that the ability of image-based signs to function depends always on a set of shared cultural references between receiver and sender (225 - 226). Colonialism in sixteenth century Mexico severed the connection between pictographic expression and its cultural referents through destruction and transliteration. Dismissing indigenous documents as idolatry, many of these were destroyed in the first years of colonization. The first books published in Mexico, made up largely of Spanish-Nahuatl dictionaries and sermons translated into Nahuatl, are products of a transliteration process whereby Mesoamerican languages were re-encoded into alphabetic form. Colonialism severed the connection between pictographic expression and its cultural referents. Marina Garone Gravier, in her analysis of translation and typography in colonial Mexico, reminds us that every transliteration is a destructive translation, insomuch as it disrupts the oral, time-based and visual elements of a language (120). In the Mexican example, transliteration occurred in a context of uneven power dynamics: a dominant culture retained the power to keep and discard certain elements of the language – choosing to retain elements that supported Spanish empire and culture (Gravier 119 - 120). The colonial period gave rise not only to conflicts of armies and territories but also to what Mignolo describes as a “conflict of literacies” ("Writing and Recorded Knowledge" 303). Alphabetic and pictographic reading and writing methods collided, and the Spanish were determined to establish the hegemony of their text-based forms. Although colonialism in Mexico led to the displacement of pictographic forms by alphabetic ones, this did not happen from one day to the next. Indeed, the initial encounter between European and native forms led to a brief period (or as anthropologist Serge Gruzinski calls it, a ‘renaissance’) of hybrid communicational codes (105). The hybridity in colonial media of the sixteenth century parallels, and helps us to understand, the hybridity and remixes that define digital media today. Colonial texts and digital platforms both combine methods from previously separate media, creating entirely new and remixed visual languages. Colonial texts contain unique combinations of writing methods borrowed from two different systems that had never encountered each other before. The production of texts in the first decades of colonialism depended on the collaboration between indigenous and Spanish agents (printers, writers, painters, scribes, and translators). The various genres of colonial documents – from translations of Christian doctrine to encyclopedias of indigenous history to records of legal cases – required combinations of Mesoamerican and European knowledge. The College of Santa Cruz de Tlatelolco presents an emblematic case of such collaborations. Here, the sons of the Nahua elite were taught by friars trained in the humanist European tradition. These Nahua students became trilingual in Nahuatl, Spanish, and Latin, and worked alongside friars to record and document indigenous traditions in the scriptorium of the school. Texts that emerged from such contexts contain combinations not only of content but also of writing methods that were borrowed from systems that had never encountered each other before. 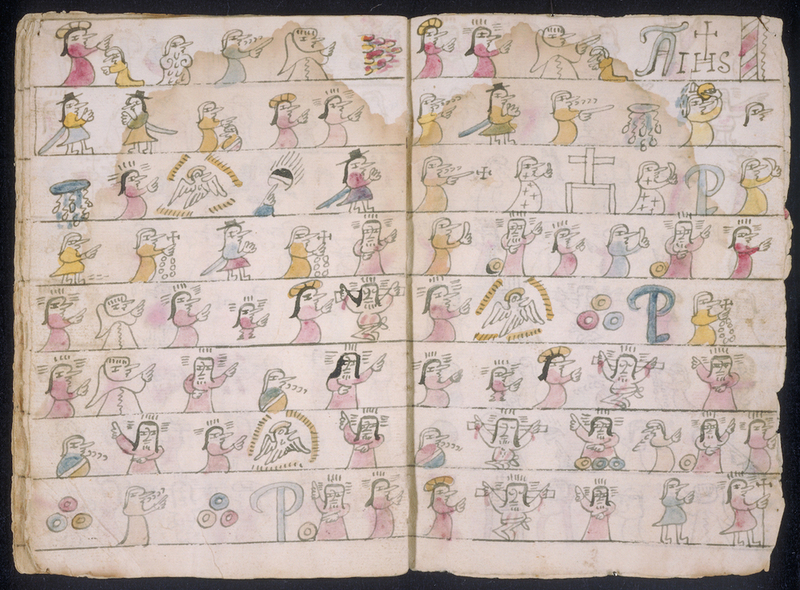 In some of the earliest attempts at evangelization in colonial Mexico, European friars appropriated elements of pictographic writing to create their cartillas or prayer books. In these small pamphlet-like books, friars utilized what they had learned about Nahua forms to make up their own pictorial system, in which various glyphs represented Christian words and concepts. The glyphs are arranged, however, in a linear sequence (as alphabetic letters would be arranged). Early cartillas combined the linearity of alphabetic text with the pictorial style of Mexican pictography. This same combination of alphabetic linearity with Mesoamerican pictographs can be see in the representations of years (which were portrayed as glyphs rather than numbers) in Nahua histories. Early sixteenth century documents show the glyphic signs for years assembled in many different spatial patterns on the page – but, in the later parts of the century, these histories adopted alphabetic-style left to right and top to bottom arrangements (Boone, "Ruptures and Unions" 215). Depictions of nahua traditions in the Florentine codex combine mimetic and pictographic styles to create a new visual language. The images in this famous chronicle of Mexican history, assembled by Bernardino de Sahagún along with students at the College of Santa Cruz, are largely mimetic. They tend to utilize European conventions of three dimensional space that are not found in traditional Mesoamerican symbols. However, some of these images do include glyphic elements. These elements are not simply illustrative or decorative. As Boone notes in her analysis of the codex, they “retain their indigenous function as glyphic signifiers” ("Ruptures and Unions" 203). In such cases, the ‘writing’ method for both kinds of images are combined as well as their reading methods, as one can read such images for their glyphic and mimetic content at the same time. In one final example of colonial hybridity, the reading styles associated with pictographic symbols can be found alongside those associated with alphabetic text in the Codex de la Cruz Badiano, a medical book based on the practices of Martín de la Cruz, an indigenous doctor. Although this text had been regarded by many historians of medicine and science as a typical European work of the herbal genre, Millie Gimmel argues that these scholars have overlooked its biculturality (169). This biculturality reveals itself not only in certain conceptions of medicine and the body but also in its hybrid reading practices. 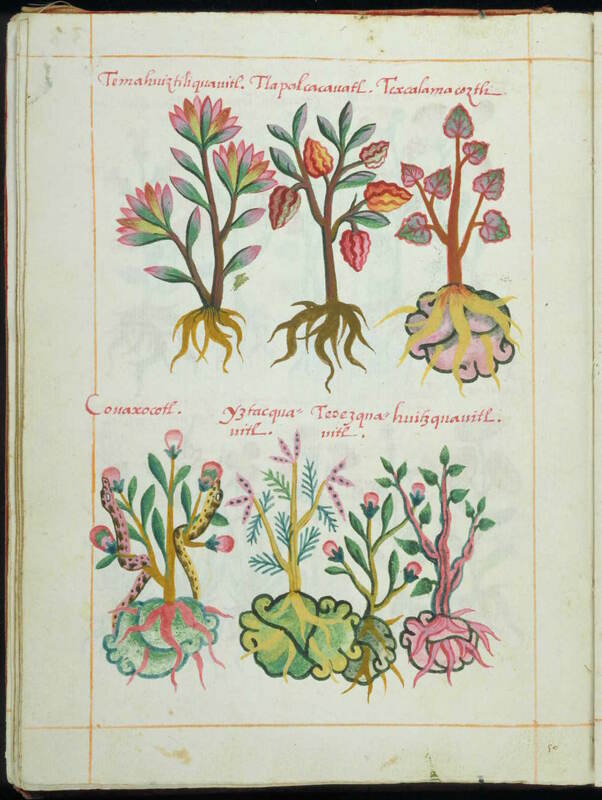 The images that accompany the alphabetic names of medicinal plants can be seen on one level as traditional, European-style images. However, Gimmel argues that some of these can also be interpreted as pictographic symbols. These symbols contain a wealth of information about the plant, as a glyphic symbol would. For example, the illustration for one plant whose Nahuatl name translates to “snake fruit” depicts two snakes eating the fruit, signifying the plant’s name without the need for alphabetic writing. The image also reveals information about the plant’s habitat that is not contained in the text. Gimmel argues that such images represent a specifically Mesoamerican reading practice: “a native reader/interpreter could discern information about these plants and their habitats without actually reading the alphabetic script” (Gimmel 180). Fragment from Codex Badiano: representations of plants that combine glyphic, mimetic, and alphabetic elements. Just as the colonial encounter provided a platform for new combinations of formerly separate communicational strategies, the software environments of a digital age provide a platform for new combinations of formerly separate media techniques. This type of hybridity in digital media content is perhaps most clearly elaborated by theorist Lev Manovich, who has analyzed the “logic of deep remixability” that operates in a media software context (Software Takes Command 268). According to this logic, it is not just the contents of separate media that are remixed, but the techniques associated with them. Manovich begins his chronology of digital hybrid media with the ideas of Alan Kay, the influential engineer who developed the Sketchpad program in the early 1960’s. Kay imagined the computer as a ‘metamedium’ where existing and new media could be simulated and utilized (Software Takes Command 161). This has become a reality: one can simulate both older media (photographs, films) and newer forms (3D animation and modeling, GIS systems) in a personal computer. Manovich argues that once media could be simulated in the same environment, they created hybrids: new visual languages that have re-defined narrative and communicational possibilities ("After Effects" 68). These hybrids occur not because the content of these media are combined. In a simulated media environment, a ‘technique’ associated with one medium (like applying color filters to a photograph, or laying out text on a page) becomes an algorithm that can be applied to many different kinds of media formats. Digital platforms create hybrid visual languages that re-define narrative and communicational possibilities. One example of this type of hybrid media can be found in digital books. Techniques associated with other media can now be applied to the pages of a book or article. A user can zoom in as she would with an image, or seek out particular words and phrases as she would in a database. This creates a new sort of experience that combines writing and reading methods from different forms. As Matthew Kirshenbaum has noted, “books on the screen are not books, they are models of books” (1). There is no single 'correct' way to model a book in the digital space, according to Kirschenbaum. Rather, the digital book allows for a range of hybrid reading experiences that echo both the traditional book and various screen-based information formats. For Manovich, the most emblematic hybrid language of our media context can be found in the genre of motion graphics. Motion graphics refers to the contemporary visual language of moving image production: a language that incorporates elements of animation, graphic design, and traditional cinema. This genre grew out of artists’ use of Adobe’s revolutionary After Effects software. After Effects offers an interface that allows users to combine layers of images across a timeline. It’s a kind of Photoshop that moves in time, creating limitless possibilities for remixing still and moving visual media from typography to still photography to traditional live action footage to 3D animation (Manovich, "After Effects" 68). Techniques are easily remixed as well: motion blur (once specific to photography) can be applied to computer graphics, animated movement can be applied to typography, changes in opacity and colors associated with graphic design can be applied to film, etc. As in our colonial examples, this hybridity does not occur through writing methods but through reading ones as well. Motion graphics have produced a new visual literacy: in the minute-long span of a commercial spot or a title sequence we ‘read’ elements from formerly separate genres: creative lettering associated with typography and print design alongside cuts associated with experimental film alongside hyperrealism associated with fashion and documentary photography. If, in the colonial period, formerly separate visual strategies collided in the scriptoriums of the College of Santa Cruz, they are once again colliding in After Effects and digital environments. Cut-out / Collage: Here the image loses it’s hyper-reality and live action feel. The two silhouettes appear as cut outs against simple yet gritty backgrounds. Deep Remixability: In a single image, the remixed nature of this type of work is clear. The genre of portraiture is combined with hyperreal landscape imagery, mapping, and typography. A knowledge of the colonial past is crucial for understanding how experimentation in media can be quashed by hegemonic structures. Although the digital manifestations of hybrid visual languages begin with thinkers like Alan Kay, there are clear antecedents to this type of visual language that can be found in colonial Mexico. Thinking about digital media alongside colonial contexts provides us with both possibilities and warnings for this (second) age of hybrid media. Power has been built not just through wars and armies but also through the systematic privileging of some languages, cultures, and forms of expression over others. Mignolo argues that the foundational ideas of our modern world are based not only in enlightenment ideals but also in ‘coloniality’, the underside of our modernity. Drawing from philosopher Anibal Quijano’s use of the word, word, ‘coloniality’ refers not to colonialism as a historical event that occurs before modernity, but rather as a part of its very essence, a constant underpinning that defines modernity and its structures of thought ("Un Paradigma Otro" 141). The biases of coloniality remain essentially the same from the Christian theological discourse of the sixteenth century to the political and economic discourses of today (Mignolo, "The Enduring Enchantment" 932 - 934). One of these biases is the preference for Western cultural forms over others. Many scholars continue to uphold a strong distinction between writing and drawing, as well as a bias against image-based documentations of history. Additionally, the precarious situation of indigenous ‘endangered’ languages, territories, and peoples shows us that we are still witnessing the effects of colonial decisions to displace non-Western forms. The experience of colonialism warns us that the hegemony of certain expressive forms does not fade quickly and can lead to devastating results, uprooting communication systems (like Mexican pictography) from their communities and chasing indigenous languages to extinction. If, as Gruzinski puts it, the renaissance of hybrid communication in sixteenth century was “smothered by the colonial machine,” these histories can warn us against the machinery of power in our own context (105). We must be vigilant against communication standards that stifle experimentation and hybridity in visual languages. Indeed, colonial histories teach us that decisions to privilege one communicational code over another often have more to do with power than efficiency or rationality. If innovation is as important to digital culture as the leaders of the tech world profess, a knowledge of the colonial past is crucial for understanding how experimentation in media can be quashed by the dictates of powerful individuals and structures. The digital age provides an opportunity to re-imagine writing as something that can exist independently of the alphabet. In addition to these dangers, we must be aware of the openings and possibilities offered by hybrid digital media. The emergence of hybrid visual languages in our digital age provides an opportunity for interrogating the divisions between text and image-based forms as well as an opportunity for challenging the biases that were established against pictographic methods. History, political thought, and journalism are no longer rooted in traditional textual forms. Alphabetic text no longer functions as an uncontested platform for knowledge production: newspapers open themselves up to social media platforms, popular political criticism is expressed and shared massively in memes and GIFs, searchable galleries of image-based records and crowd-sourced websites provide us with historical context. These changes may provide an opening to imagine writing as something that exists independently of the alphabet and to affirm, as Mignolo writes, that “the history of writing is not an evolutionary process driving toward the alphabet, but rather a series of co-evolutionary processes in which different writing systems followed their own transformations” ("Literacy and Colonization" 62). Colonialism and other encounters may have provided the original ‘remixes,’ but if we can embrace the multiplicity of hybrid forms of this remixed digital age, perhaps we can also embrace the multiplicity of experiences and communicational codes that exist in our globalized world. The hybrid ‘metamedium’ of digital platforms, where many media and genres exist together, may provide precisely the platform needed to “construct a world in which many worlds fit” (Mignolo, "Un Paradigma Otro" 144). The digitized versions of colonial-era texts are excellent examples of the way digital content is shaped by both an ever-present coloniality and a series of brand new possibilities. Libraries, museums, and cultural institutions all over the globe are digitizing their collections – and sixteenth-century Mexican documents have certainly become a part of such initiatives. Websites like Códices de Mexico (codices.inah.gob.mx) and Primeros Libros de las Americas (http://primeroslibros.org/) offer users high-resolution scanned digital surrogates of printed and painted colonial documents. Indeed, these texts have been scanned and uploaded as digital copies. Digitization does not create direct copies of historical documents, but instead transforms them. In a sense, the information, languages, and cultures contained within these documents continue to be translated and re-mediated, as in the colonial period. If indigenous languages were once translated into Western alphabetic forms, they undergo yet another translation when converted into digital content. Processes of colonialism (as well as semiotic and post-modern theories) remind us that language is never a transparent container and, similarly, digital platforms are not transparent containers. Digitization does not create copies of these documents, but instead transforms them. In a way, these transformations might reveal a continuing logic of coloniality: a logic that states we must translate all knowledge into modern and hegemonic forms, just as indigenous expression was translated into alphabetic form. Digital tools for preserving documents online, are, after all, connected to imperial centers and languages: virtually all of the metadata and code that mark up and display these colonial texts contain English and Spanish words and stem from U.S.-based innovations. However, these digital surrogates also present new visual possibilities for displaying and understanding these historical texts. In being scanned and converted to digital images, these texts-turned-images invite new readings. If colonial print culture sought to turn ‘barbaric’ image-based forms into ‘civilized’ alphabetic textual ones, the process has, in a way, been flipped on its head. This flip invites us to question, as we read and utilize colonial images, the notion that books are the superior mechanism for recording written language, and that they are vastly different than image-based writing. If, in a digital age, our history becomes digital images, can we still consider alphabetic language as a superior evolutionary endpoint? When digitized, colonial texts also enter the world of computational data, which enables new possibilities for interaction and analysis. Through a project entitled “Reading the First Books,” scholars, librarians, and programmers are developing an optical character recognition (OCR) program that will be able to identify and transcribe words in the scanned images of printed books from Colonial Mexico. They are extending already-existing OCR capacities so that this technology can work with early modern multilingual texts, and specifically with the first books printed in Mexico (Alpert-Abrams). Digital interventions like this one create hybrid reading methods that combine practices associated with digital images, traditional books, and searchable databases. Rather than reading these books as individual and standardized representations of indigenous languages, users will be able to analyze them as a corpus – easily scanning them for certain word usages and references in order to shed light on the colonizing transliteration process. In her analysis of the visual language employed in the colonial Codex de la Cruz Badiano, Gimmel urges scholars to conceptualize the codex as a hybrid text, rather than forcing it into Western categories. Indeed, for Gimmel and other Mesoamerican scholars, colonial documents present “a richer combination of information and genres” than their European counterparts (190). The Codex Badiano was produced in a unique moment of experimentation and cultural encounter that produced completely new combinations of alphabetic and pictographic expression. Reflecting on the difficulty of deciphering such unique combinations, Gimmel writes that “the ideal readership for the Codex did not exist at the time of its composition. In fact, it is possible that the ideal readers have only recently come into existence as scholars attempt to disentangle the multiple layers of meaning woven together in the Codex de la Cruz and become more familiar with the languages and cultures contained in it” (190). An understanding of colonial-era remixes can make us better readers and producers of our own digital remixes. Gimmel argues that the ideal readers of colonial codices exist today because 21st-century scholars have acquired the knowledge needed to parse through such complex cultural products. This is certainly true, but perhaps it is also our every day experiences with contemporary hybrid media in a digital age that allows us to better understand colonial hybridity. Conversely, an understanding of colonial-era remixes can make us better readers and producers of our own contemporary remixes. Examining the colonial remix is a jumping off point for taking advantage of the media combinations that the digital age facilitates. It’s also a vitally important place from which to question the way power and hegemonic forms operate in a digital age. It presents an opportunity to analyze the ways in which coloniality and colonial prejudices might continue to stifle hybrid experimentations, voices, and experiences. Boone, Elizabeth Hill. “Presidential Lecture: Discourse and Authority in Histories Painted, Knotted, and Threaded.” Ethnohistory 59.2 (2012): 211–237. ---. “Ruptures and Unions: Graphic Complexity and Hybridity in Sixteenth-Century Mexico.” Their Way of Writing: Scripts, Signs, and Pictographies in Pre-Columbian America. Ed. Elizabeth Hill Boone and Gary Urton. Washington, D.C: Dumbarton Oaks Research Library and Collection, 2011. 192 - 223. ---. Stories in Red and Black: Pictorial Histories of the Aztecs and Mixtecs. Austin, TX: University of Texas Press, 2000. ---. “Writing and Recording Knowledge.” Writing Without Words: Alternative Literacies in Mesoamerica and the Andes. Ed. Elizabeth Hill Boone and Walter D. Mignolo. Durham: Duke University Press Books, 1994. 3 - 26. Eco, Umberto. La Estructura Ausente, Introducción a La Semiótica. Barcelona: Editorial Lumen, 1972. Gimmel, Millie. “Reading Medicine in the Codex de La Cruz Badiano.” Journal of the History of Ideas 69.2 (2008): 169–192. Gravier, Marina Garone. “Diseño Tipográfico: Claves Para Una Traducción Sin Traición.” Páginas de guarda: revista de lenguaje, edición y cultura escrita 1 (2006): 117–128. Gruzinski, Serge. The Aztecs: Rise and Fall of an Empire. New York: Harry N. Abrams, Inc., 1992. Kirschenbaum, Matthew. "Bookscapes: modeling books in electronic space." Human-Computer Interaction Lab 25th Annual Symposium (2008): 1 - 2. Manovich, Lev. “After Effects, or Velvet Revolution.” Artifact 1.2 (2007): 67–75. ---. Software Takes Command. London: Bloomsbury, 2013. Mignolo, Walter D. The Darker Side of the Renaissance: Literacy, Territoriality, and Colonization. Ann Arbor: University of Michigan Press, 2003. ---. "The Enduring Enchantment: (Or the Epistemic Privilege of Modernity and Where to Go from Here).” South Atlantic Quarterly 101.4 (2002): 927–954. Prisma Institute, 1989. 51 - 96. ---. “‘Un Paradigma Otro': Colonialidad Global, Pensamiento Fronterizo y Cosmopolitanismo crítico." Dispositio 25.52 (2005): 127–146. ---. “Writing and Recorded Knowledge in Colonial and Postcolonial Situations.” Writing Without Words: Alternative Literacies in Mesoamerica and the Andes. Ed. Elizabeth Hill Boone and Walter D. Mignolo. Durham: Duke University Press Books, 1994. 292 - 312. Yuste Alonso, Ruth. “Como pez en el agua, una propuesta didáctica a partir del análisis de la imagen publicitaria.” El Guiniguada 20(2011): 197 - 214.